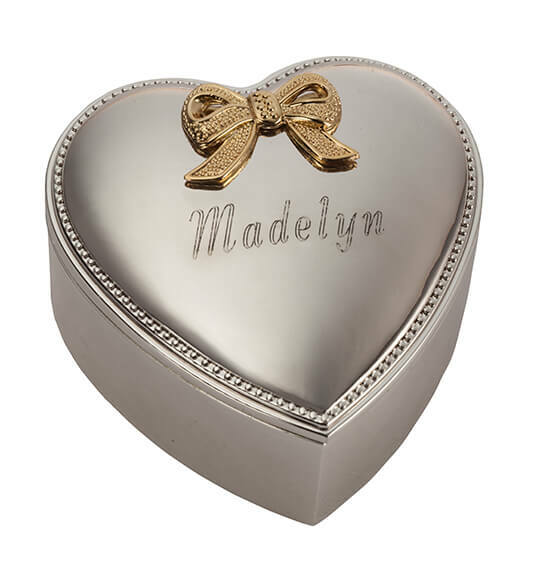 Personalize a keepsake from the heart with this Personalized Silver-plated Heart Box with a gold-plated bow on top from PersonalizedThings by Exposures. Each silver-plated lid has a smooth finish with silver-plated beading that frames the top lid. The velvety burgundy lining will protect jewelry and other small treasures. 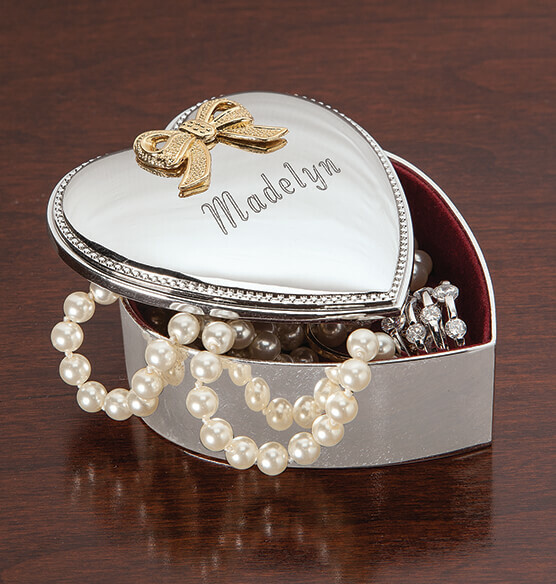 This personalized silver-plated heart box makes a memorable Valentine’s Day gift and is a lovely way to show someone they are loved on any occasion. Personalize this custom gift with an engraved name for a mother, grandmother or dear friend. Personalize with up to 1 line, 13 letters and spaces. This lovely 2-pc. heart-shaped gem box measures 3" by 2 3/4" by 1 3/4". "I bought one last year and 5 more now. Makes a perfect, safe place to store rings and other jewelry while cleaning or working in the kitchen, or for any time. THIS INEXPENSIVE GIFT MADE MY SWEETHEART SO HAPPY, YOU WOULD HAVE THOUGHT I SPENT A FORTUNE ON IT.THANKS FOR MARKETING SUCH NICE ITEMS DRAKE. I wanted a classy silver box to hold a special birthstone and gold necklace for my granddaughter's high school graduation gift. Her name engraved made it even more special. It was the perfect size. I'm using this beautiful heart box for some special objects. It is a perfect size to put just a few things in, not so small that you can't fit anything and not too big that it takes up a lot of room. It looks great in any area of the house. my daughter loves hearts, so this was right up her alley. It was given as a Christmas gift and she says it is special to her. This is a great gift for a close family member or a new friend. Always appreciated by the recipient! I bought this as a gift, so the it is a lovely small personalized gift for someone. But it coming in a plain box w/Made in China clearly written made it look cheap & tacky. I would only recommend it to someone if I knew your company changed the packaging. The product was supposed to be a Christmas gift for my grandaughter. The engraver made a scratch mark on it.It had others areas that were scratched as well.It also arrived very poorly packaged along with several other items and all the items were able to tumble around inside the box. I was very disappointed.